Ubuntu Software Center Slowly Turning Around, Adds More Paid Applications! Ubuntu Software Center is getting updates almost everyday. The latest one brings in more paid applications into Ubuntu Software Center. And it's good to see Canonical slowly waking up to one of its most important revenue making opportunity. 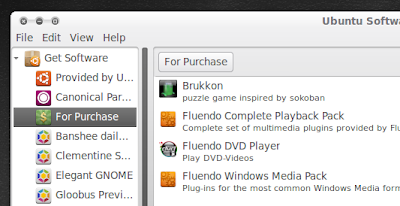 Few days ago, Brukkon puzzle game became the second candidate ever to occupy space meant for paid applications in Ubuntu. The first one being Fluendo DVD player. 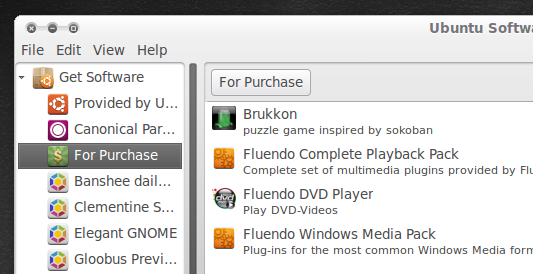 The latest additions to Ubuntu Software Center include Fluendo Complete Playback Pack priced at $34.99 and Fluendo Windows Media Pack at $24.99. Plugins that comes with Fluendo Complete Playback Pack include Windows Media Audio Decoder Stereo, Windows Media Audio Decoder Stereo, Windows Media Audio Decoder Stereo, Windows Media Audio Decoder Stereo among others. While Fluendo Windows Media Pack provides plug-ins for almost all the common Windows Media formats. Ubuntu Software Center received all the attention in the world during Ubuntu 10.10 release cycle and IMO it is safe enough to call it as the application that received maximum attention. And the kind of attention Software Center receives is justifiable too. Along with Ubuntu One, Ubuntu Software Center is definitely going to be one among most important revenue generator for Canonical and Ubuntu in the future. Consider these new paid applications as the first signs of Ubuntu and Canonical going cash flow positive.